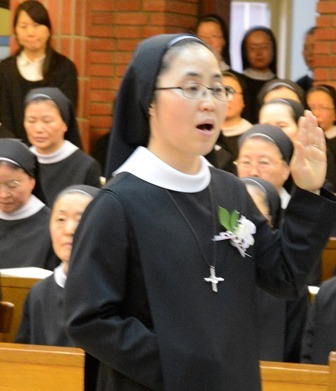 For the Missionary Benedictine Sisters in Daegu Priory, February 10, 2014 was a double feast. It was the Solemnity of St. Scholastica, the twin sister of Saint Benedict. This is a special feast for all Benedictines, especially Benedictine Women religious. It was also the day when five Sisters made their final Monastic profession of the vows of Stability, Conversatio, and Obedience and pledge lifelong fidelity to the Missionary Benedictine way of life. The Brides had this to say about themselves and what the day meant for them. English is not their first language, and so we did not edit the statements to retain their words. Hello, Sisters! 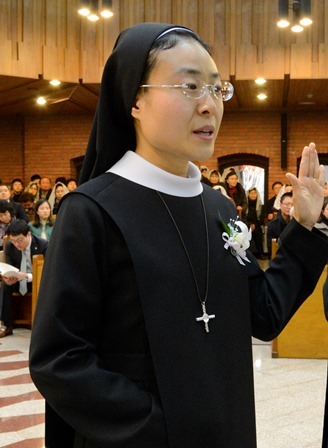 I am Sr. Pauline (Sangsun) Park. I am glad to greeting by letter to you. As St. Paul said, "It is no longer I who live, but it is Christ who lives in me. "(Ga 2, 20), I also confess that to the Lord. I would like to increase my merits- much more patient, strong and gentle points. And I wish to accept my defects- laziness, the lack of the discretion and to be holy entirely in Christ Jesus with God' help. Thank you for your prayers. I am very glad to share my pleasure through final vows to you. I am Haeseong(海星) Kim. I was born in May 9th, 1978 in my parent's love. I have an elder brother and a younger sister. My vow's name, Haeseong is the Chinese character that means "The Stars of the Marine", Mother Mary's nickname. 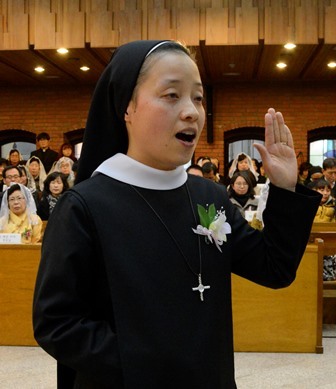 Our elder Sisters have been using this name with kindergarten's name, wishing that Korean children may become big stars in Korea in result of Mother Mary flashing the wisdom to them like the stars of the marine. I also wish to be happy Sister who searches and loves only Christ through Mother Mary's help. I give thanks to God and all Sisters praying for us. Hello. I do not well introduce myself in English. I'm eldest. I have three younger brothers. I grateful for the Faith of my heritage, aware that my parents' dreams live on in my life. I entered convent 10 years ago. Really, I have come so far. I have seen so much in my community. I want to be a good sister. I respect St. Joseph. Now Jesus my only desire. So I'm happy. So very happy. I give thanks to the Lord. Final vow! This is my chance to answer his call. This is my moment. I'll be a good sister. 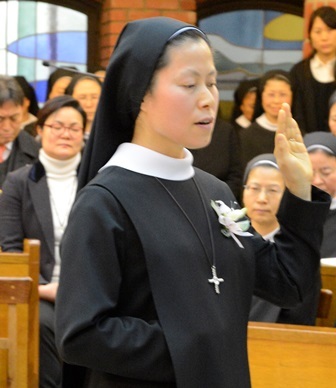 I ask you to pray for me to be a good Missionary Benedictine sister. How do you do, Sisters? I am very happy to have final vows and I am glad to share my pleasure with you. 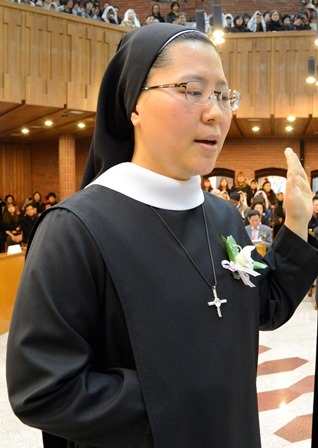 I am Sr. Fransoa (Mikyeong) Lee. I was born in the countryside of Yangsan in Korea. My parents are farmers and I baptized at the age of twenty. My families are not Christians. So I had been difficult to be nun but through the help of my God I could enter in this convent at the old age of 35. I give thanks to the Lord guiding and protecting me. And I also thank God to let me know him. Now I offer my whole life to the Lord willingly. Let me introduce myself. I'm Sr. Stephanie. My name is Su-young Park. I'm from Daegu in Korea. I have 1 elder brother, 3 elder sisters and 1 younger brother. I enjoy taking the sun so my body likes to climb the mountains. I am concerned about computer technology and embroider. I will have final vow at 10th. Feb. 2014 years. I wanted to become good praying ascetic so now I'm very happy. Please pray for me. Thank you!